Internet Explorer 7 has gone from 37.6% to 20.3%. Internet Explorer 6 has more than halved, from 18.4% to 8.4%. Internet Explorer has lost a total of 10 percent market share to more modern browsers. Half of all Firefox users have upgraded to the latest version, 3.5*. At 20.7% – three months after release – it is already the most used browser version in Europe, and looks likely to reign supreme until 3.6 is released in a few months. 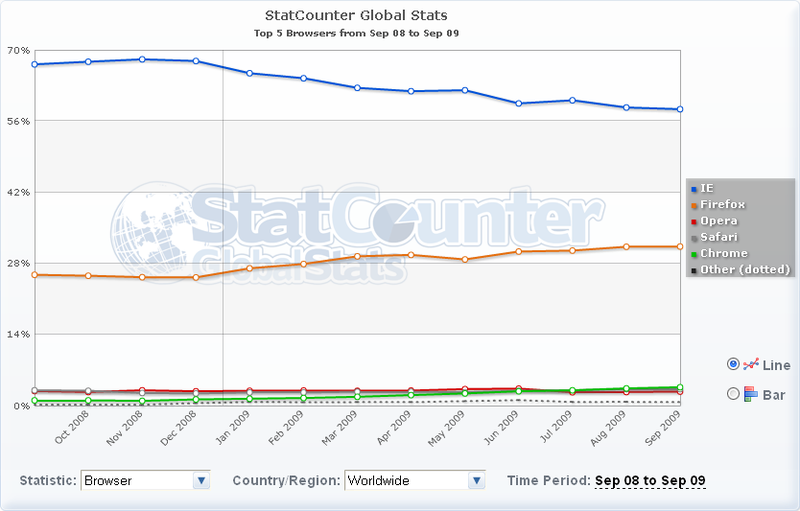 Firefox 2 has decreased from 9.4% to 1.6%. All in all, somewhere around 60% of Internet users in Europe have moved to a newer browser. *) This chart beautifully illustrates the efficiency of Firefox’s automatic update system compared to that of Internet Explorer (Windows Update). Firefox 3.5 has got further in three months than IE8 has in 6!! It wouldn’t surprise me if the Firefox 3.5 update is the fastest ever in the history of software, measured in number of users per time. Internet Explorer (6+7+8) has gone from 67.2% to 58.4%. Firefox has gone from 25.8% to 31.3%. 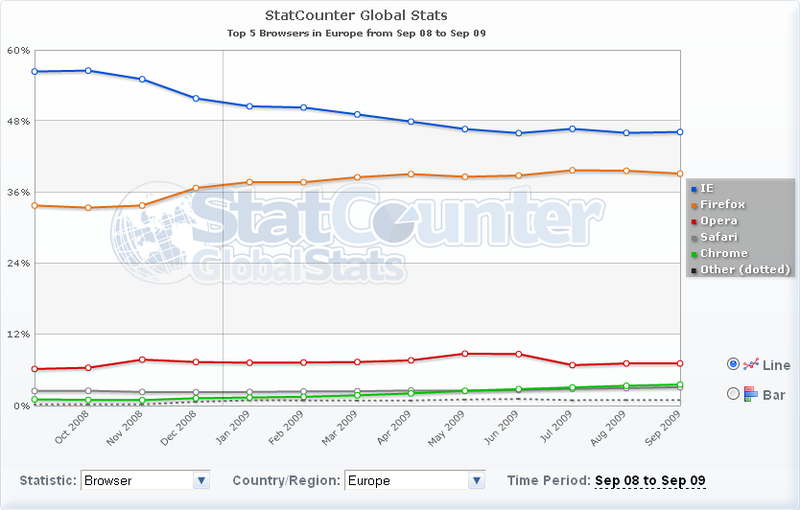 Internet Explorer 7 peaked at 41.9% in December and has since lost 17 percentage points, mainly to IE8. 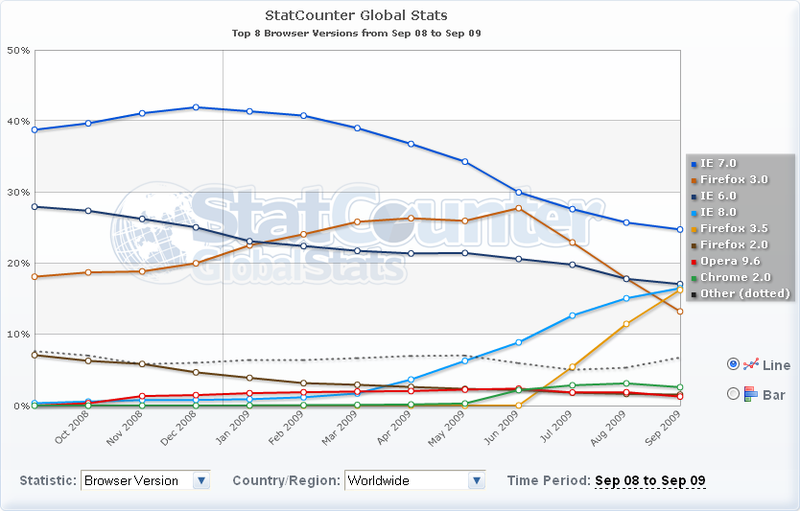 Internet Explorer 6 has lost a heap of users, down from 28.0% to 17.1%. During the last year, more than 50% of Internet users have upgraded their browsers. Obviously, all these numbers are all according to Statcounter only. NetApplications numbers tend to show Firefox at slightly numbers. The trends are essentially the same, and the Statcounter graph tool is so much nicer to use. Posted at 18:59. Tags: Google Chrome, Opera. Categories: browsers, Internet Explorer, Mozilla Firefox. Both comments and trackbacks are closed.